The suicide bomber, known as Abu Hurayra the American who used a truck bomb to carry out a suicide bombing attack against the Syrian army (Twitter). A British suicide bomber named Abd al-Wahid Majad (Sadaalsham.net, February 15, 2014). 1. On May 25, 2014, an American citizen of Jordanian-Palestinian extraction known as Abu Hurayra the American was one of the perpetrators of a complex suicide bombing attack on Syrian army targets. The attack was carried out by the Al-Nusra Front, the Syrian branch of Al-Qaeda. Four trucks were blown up simultaneously. On May 31, 2014, the State Department said the American involved in the attack had been identified as Moner Mohammad Abusalha, a young man in his 20s from Florida. He joined the rebels in Syria in 2013 and trained at an Al-Nusra Front camp for two months (Nytimes.com, May 30, 2014). 2. Carrying out suicide bombing attacks against the Syrian regime is the leading modus operandi of the Al-Nusra Front and the Islamic State in Iraq and Greater Syria (ISIS). They have carried out a large number of such attacks since 2012, causing loss of life and damage to the Syrian regime, damaging the symbols of its government, harming its sovereignty, and raising the prestige of the jihad organizations involved. Foreign fighters were conspicuous among the suicide bombers, most of them from the Arab-Muslim world, and some from the West. Insofar as is known, Abusalha was the first American citizen to carry out a suicide bombing attack. There were, however, a number of instances in which suicide bombers from other Western countries carried out such attacks: Australia and Canada (in 2013) and Britain (February 2014). 3. In our assessment, the significant participation of foreign fighters in suicide bombing attacks, especially fighters from Western countries, indicates the high level of their jihadist motivation. 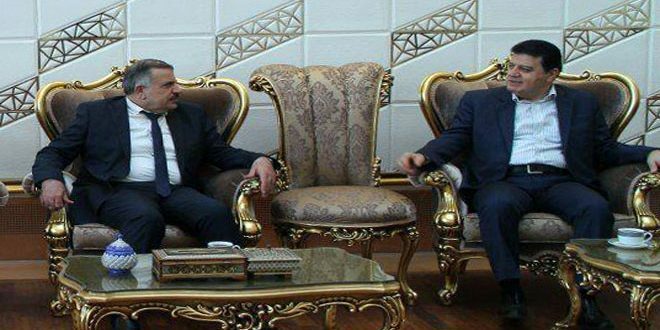 It is a function of the basic religious zeal that led to their going to Syria in the first place, fostered during their stay there through religious indoctrination combined with military activity in the ranks of the Al-Nusra Front and ISIS. In our assessment, the military capabilities acquired by the foreign fighters in Syria and their strong motivation to jihad (to the point of readiness to die in a suicide bombing attack) increase the risks of their involvement in terrorism and subversion when they return to the West as veterans of the Syrian civil war. 4. The number of Americans who have joined the ranks of Al-Qaeda and the global jihad in Syria is lower than those from Western Europe, but it is constantly rising. According to an updated estimate from senior American intelligence and security sources, since the beginning of the civil war approximately 100 Americans have gone to Syria or made an attempt to go. Most of them joined organizations affiliated with the global jihad (CNN.com, June 1, 2014). According to a different estimate, there are about 70 Americans involved in the Syrian civil war. However, the updated estimates are significantly higher than those issued in 2013 (which mentioned 12 to 15 Americans). In ITIC assessment, that reflects an increase in their numbers as well as an increased American intelligence and security service awareness of the phenomenon itself and its potential dangers. 5. 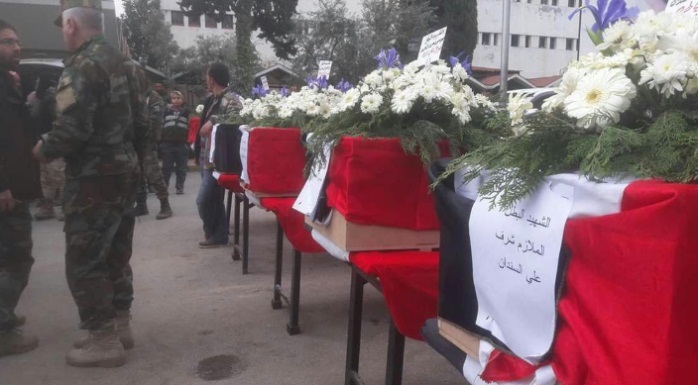 On May 25, 2014, a complex suicide bombing attack was carried out in the Idlib district in northern Syria, targeting Syrian army targets. It was carried out by the Al-Nusra Front, possibly in collaboration with another jihadist organization. 6. The Al-Nusra Front said in an Internet posting that four truck bombs, detonated simultaneously, had been used in the attack (Miamiherald.com, May 31, 2014). One of the trucks was driven by an American. According to various claims, the truck driven by the American carried the largest amount of explosives, 17 tons, as well as artillery shells (CNN.com, May 31, 2014). Left: The explosion caused when the truck detonated. 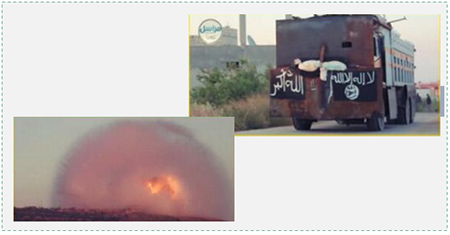 Right: The truck driven by the American suicide bomber (Twitter). 7. 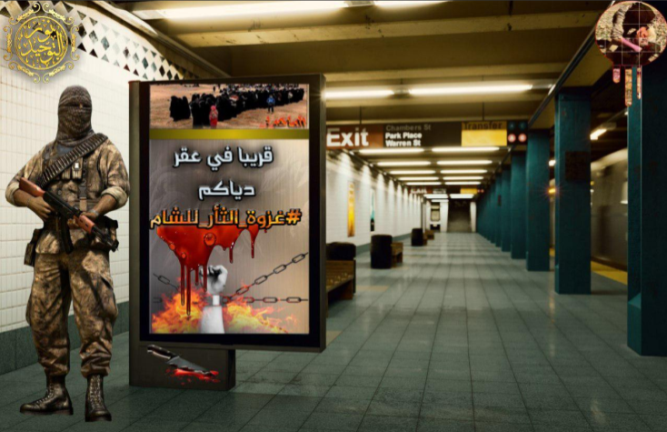 The social networks posted a picture of an American citizen nicknamed Abu Hurayra the American, claiming he had carried out the suicide bombing attack. 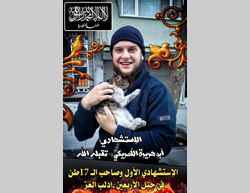 A YouTube video entitled "Al-Nusra Front's American Suicide Bomber" shows him praying, playing with cats and preparing himself for the attack. The video ends with an enormous explosion caused by the detonation of the truck bomb he was driving. According to one of the organization's spokesmen, all the foreign fighters who come to Syria are asked to use nicknames and they do not reveal their real names, in order to guard the security of their families at home (Miamiherald.com, May 31, 2014). 8. On May 31, 2014, five days after Abu Hurayra the American's death in Syria was reported, the American State Department, law enforcement and intelligence agencies definitely identified the American killed in the suicide bombing attack as MonerMohammad Abusalha (Miamiherald.com, Foxnews.com, May 31, 2014). It was reported that Moner Abusalha was 22 and lived with his parents in Vero Beach, Florida, where they owned a number of grocery stores. The origins of the family are Jordanian-Palestinian (the Abusalha clan comes from Nablus) (Syriaishere.com). He attended a number of colleges but did not receive a degree. At one he played basketball (Miamiherald.com, May 31, 2014). He was expelled from another after an altercation with a student who laughed at his mother's traditional Muslim dress. 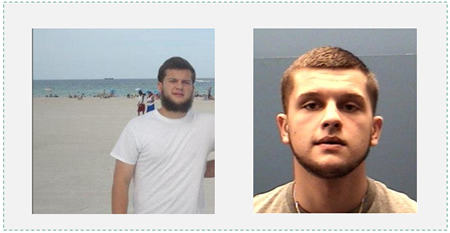 His fellow students said he was a devout Muslim and participated in religious events (Washingtonpost.com, June 2, 2014). Left: Facebook picture of Moner Mohammad Abusalha. Right: College picture of Moner Mohammad Abusalha (Seminole State College of Florida). 9. Moner Mohammad Abusalha went to Syria a year ago.He left suddenly and kept his going a secret. Only after a week did he send a message to his parents telling them that he was in Jordan. He apparently spent two months in an Al-Nusra Front training camp in Aleppo (Washingtonpost.com, Nytimes.com, May 31, 2014). Assad Kanjo, a Syrian opposition activist, claimed that when Abusalha arrived in Syria he tore up his American passport. He said not even the local commanders were surprised. He also said that his own personal impression was that that he was an American of Arab extraction because he spoke literary Arabic with a foreign accent (CBS.com, May 31, 2014). According to the American authorities, Abusalha had no criminal record and was not known to have ties to terrorism. Thus there was no reason to detain upon his return to the United States (Washingtonpost.com, June 2, 2014). 10. According to the American media, Moner Mohammad Abusalha's family did not know he was in Syria because he sent them emails leading them to believe he was in Jordan. While sources within the United States war on terrorism knew he had entered Syria, they had no information about his activities or his ties to Al-Qaeda supporters until the video of the suicide bombing attack was issued. According to American intelligence sources, American fighters like Moner Mohammad Abusalha become invisible as soon as they cross the border into Syria. The inability to track Abusalha illustrates what American intelligence calls "black holes" regarding the tracking of Western fighters in Syria (Washingtonpost.com, June 2, 2014). 11. Intelligence and security sources in the United States have expressed concern over the potential for terrorism and subversion presented by American fighters in Syria and other arenas of Islamist jihadist confrontation. At the beginning of December 2013 a hearing was held in the Senate's Homeland Security Committee to discuss threats to the homeland. Senator Tom Carper (D-Del.) said "… know that American citizens, as well as Canadian and European nationals, have taken up arms in Syria, Yemen and Somalia. The threat that these individuals could return home to carry out attacks is real and troubling" (ITIC emphasis) (Carper.senate.gov). 12. According to the New York Times (February 9, 2014), the FBI Director James Comey said that monitoring Americans who returned from Syria had become one of the highest counterterrorism priorities. American security sources reported that the FBI was conducting round-the-clock surveillance on a small group of Americans who had already returned from Syria. A senior official in the war on terrorism told a New York Times reporter that "We know Al-Qaeda is using Syria to identify individuals they can recruit, provide them additional indoctrination so they're further radicalized, and leverage them into future soldiers, possibly in the U.S."
13. At the beginning of May 2014 FBI Director James Comey admitted that the stream of fighters from the United States to Syria had grown in recent months and that several dozen Americans had joined the civil war in Syria, along with several thousand Europeans. He compared the war in Syria to the war in Afghanistan in the 1980s and '90s, when fighters established Al-Qaeda and proclaimed war on the United States, later leading to the September 11, 2001 attack. He said that the number of people going to Syria or considering going to Syria had grown by several dozen since the beginning of 2013. He added that there were American fighters in Syria who were trying to recruit other Americans to join them (Al-Jazeera, May 3, 2014). 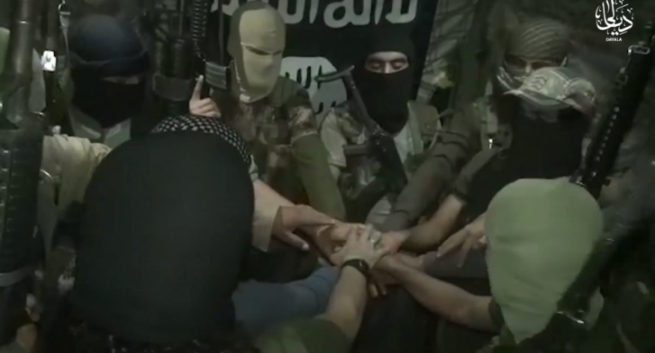 The American authorities have been examining the recruitment networks which they claim finance the fighters' trips to Syria, with the objective of stopping the flow of money and the recruiting (CNN.com, May 31, 2014). 14. The American media reported that the American attorney general in the Department of Justice ordered focus to be brought on the threat and that foreign fighters in Syria who had joined the fighting be monitored, including the Americans. His intention is to bring in experts and to collaborate with agencies in Europe and other places. The FBI set up a task force to identify Americans who might decide to go Syria in the future and they are working with intelligence and law enforcement agencies to investigate them. The State Department also instructed its diplomats around the globe to enlist partners in other countries for collaboration (CNN.com, May 31, 2014). According to law enforcement agencies in the United States, as many as a dozen Americans who returned from Syria have already been investigated or interrogated (Washingtonpost.com, June 2, 2014). For further information see the February 11, 2014 bulletin "Using suicide bombers as weapons: The leading modus operandi in the Al-Nusra Front and Islamic State in Iraq and Greater Syria's struggle against the Syrian regime and Hezbollah in Lebanon." For further information see the February 19, 2014 bulletin "The Al-Nusra Front recently carried out a suicide bombing attack in Aleppo, using a British foreign fighter." For further information see the February 3, 2014 bulletin "Foreign fighters from Western countries in the ranks of the rebel organizations affiliated with Al-Qaeda and the global jihad in Syria." According to Muslim tradition, Abd al-Rahman ibn Sakhr Al-Azdi, was called Abu Harairah ("little cat") by the prophet Muhammad. He was one of Muhammad's comrades and wrote down many of the hadiths (the Muslim oral tradition). He converted to Islam at a relatively late date and arrived in Madinah during the seventh year of the Hegira. He liked cats, and that was the source of his nickname. He was considered as having devoted his life to Islam and Muhammad. Shi'ite Islam is critical of the authenticity of his hadiths.